Is the sea food diet right for you? It may be if you have a high metabolism and don't mind to eat everything because you are not going to gain weight anyway. Everybody knows if you have a high metabolism you can afford to do on the see-food-diet and eat everything while still staying skinny even though experts on dieting and health would differ in opinions giving hard working diets that work a fighting chance to succeed. How do skinny people eat so much without gaining weight? You may have heard the story about how a big eater becomes thin present in the world today on the see food diet. To people trying to diet the high metabolism of competitive eating champions such as Takeru Kobayashi a legend in his home of Japan and throughout the world is something ordinary people envy. 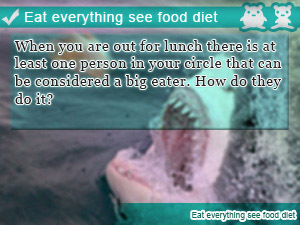 It is said that the big eater that becomes thin is a problem of a human body composition. Although, I think that there are some persons who would like to become the body which does not grow fat even though you eat everything. In this take on Slism, we are going to discuss the many factors that separate people who eat everything and still don't get fat due to a fast metabolism, and those who don't just like any Average Joe on a diet trying to lose weight. People called the big eater which does not grow fat however it may eat, and which becomes thin. Many athletic men or women and pretty thin, slender but some people something to compete in championship gluttony of TV programs. Is not growing fat even if it eats only many that's, when related to a body composition? The body composition was summarized. It is called that it is gluttonous, and many of people who have a body composition not fat no matter how it eats seem to have the key that resolves the puzzle about becoming thin in a digestive organ. In fact, it is thought that the structure of the stopper to adjust movement of blood and the food called a certain "valve" to in the digestive organs becomes loose. That time suffers from movement of the food, and the person ready to carry out an address tightly is digested and absorbed slowly, because a valve is loose, the digestive organs of people of the body composition not to gain weight even if I eat have a short time when food remains in the digestive organs, and the nourishment which I ate is hard to be absorbed. In addition, the basal metabolic rate seems to be high, there to be originally a lot of momentums of every day, and the person's lifestyle be related, too. It is said that a mast cell called the brown fat cell which the person has is related if the thing of a body composition is said in detail. How to activate brown fat cells without breaking a sweat? 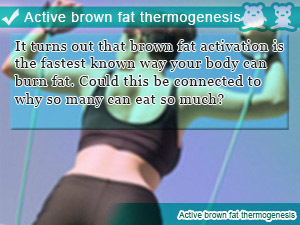 A brown fat cell is a cell which carries out heat use, releases the energy surplus while keeping body temperature constant, and prevents overweight in order to protect the body from change of temperature, or an external stimulus. It is said that it does not grow fat easily even if it eats, in order that work of a brown fat cell may be high, may decompose nutritive substance and may release bodily energy as heat the devouring type which becomes thin. It seems that nutrition will be sent to white adipose cells rather than a brown fat cell, and the work of a brown fat cell of the person that only a part to have eaten will grow fat on the contrary has become blunt. Those though you do not gain weigh eating in your youth, the eating person gains weight without changing as youth even if you get old. The second is the illness by overeating vomiting etc. A diet which is not eaten, mentioned as a wrong diet representative and those who are performing this will abstain from food for many days. Even if it can beer several days of the start, it becomes impossible to bear them some day. Then, the point which reaches is said to vomit, if it eats. Will the nutrition to have eaten also be breathed out and will it be thought that it does not grow fat? Although it repeats the relief of not growing fat, and vomiting if it eats by vomiting and returning only a part to have eaten, eating unawares only stops stopping and it is said that overeating and vomiting are repeated. What It Takes To Become a Big Eater: Stepping Up Your Eating Game? If people who will grow fat if eating it want to improve a body composition to the big eater which becomes thin even from now? - However it may eat, let's find whether it is improvable to the body composition in which it is hard to grow fat. We are calling fat the white adipose cells currently attached to subcutaneous fat etc. The fetal stage where the time to receive change of adipose cells is still in the motherly belly called adolescence etc., the infancy after being born. Adipose cells should increase, and if a calorie is taken in too much at the time when this adipose cell changes, since they become a body composition in which it is easy to grow fat, let's will be careful of them. If you are wondering about the calories in seafood go here. And although it is whether it is improvable to the "big eater which becomes thin" body composition in which it does not grow fat even if it eats from the present condition, it seems that it is difficult. Let's make a brown fat cell active or increase an amount of consumption to improve to the body composition in which it does not grow fat from the body composition in which now grows fat easily even if it eats. Since a brown fat cell is activated at low temperature, if underwater movement is taken into a diet and stimulated, exercise and the double effect may be acquired. How to trick your body into firing up brown fat cells to burn calories? How about taking care about the way of eating which does not grow fat in dieter, although it does not get used to the big eater which becomes thin? It takes care about food eaten together, or the meal method, a time zone, etc. are mentioned to the method which is utilized on a diet and which does not grow fat even if it eats. If you pay attention to various problems related to diet, you may enjoy the feeling gluttony? When you are out for lunch there is at least one person in your circle that can be considered a big eater. How do they do it? 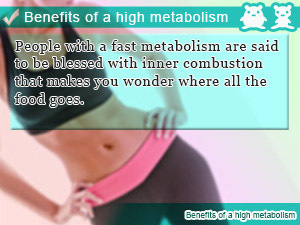 People with a fast metabolism are said to be blessed with inner combustion that makes you wonder where all the food goes. It turns out that brown fat activation is the fastest known way your body can burn fat. Could this be connected to why so many can eat so much?